The Federal Reserve just kept monetary policy on hold, as expected. On Wednesday the Fed announced that its benchmark interest rate will remain pegged between 0.25%-0.50%, where it’s been since December 2015. In its statement, however, the Fed kept a key piece of language that at least in the eyes of one economist shows they are too hawkish relative to economic fundamentals. Said another way: the Fed still seems to want to raise rates though market conditions (and the market’s view of the economy) don’t really warrant this action. Well, when markets read the statement on Wednesday, at the end of the first paragraph what did they find? In his email, Dutta said (somewhat tongue-in-cheek) that retaining this language would be a sign to short stocks. 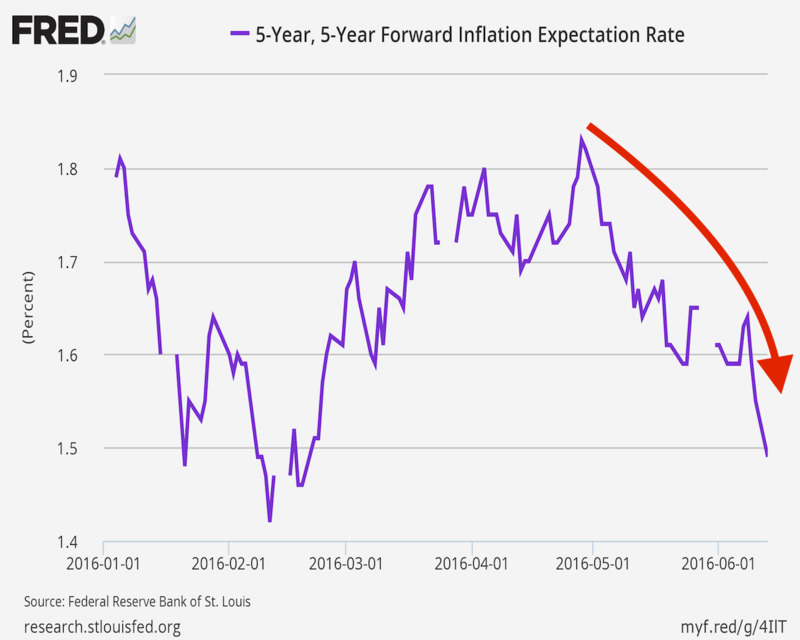 As the chart below shows, inflation expectations as measured by the Fed’s 5-year, 5-year inflation swap rate have declined markedly over the last month. Meanwhile, the latest inflation expectation reading from the University of Michigan’s consumer confidence survey showed expectations for inflation down to 2.4%, a fresh six-year low. 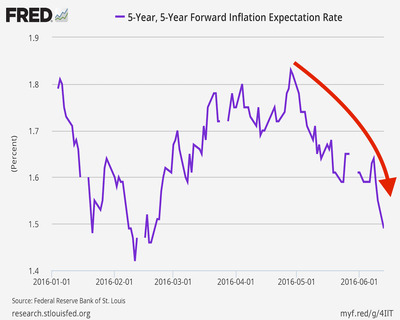 This again, in Dutta’s view, shows a clear disconnect between markets, which are dragging rates lower in response to lower expectations about future growth, and the Fed which seems to want to raise rates into this action. We’ve long believed that the policy statement is the principal conduit for FOMC communication. If the statement maintains its existing language, describing survey measures of long-term inflation expectations as “little changed,” it would be the rough equivalent of former Senator Phil Gramm saying the US was in a “mental recession” back in July 2008. Should the FOMC fail to change this language, they would be sending an unnecessary hawkish signal to the capital markets.